This was the first utility created by Rodney for the SoftGrid platform. The utility exist of a single executable that does not need any installation. The only requirement is that (logically) the SoftGrid Client is installed on the same system. When you start the utility an additional icon will be added to your tray bar. So if you want to use the tool it's a good idea to add a shortcut of the executable in your startup folder. The SoftGrid System Tray utility makes is very easy to perform the most used commands during testing of the SoftGrid sequences. 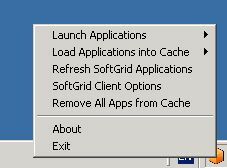 With just two mouse clicks you can: launch applications, preload applications, clean the current cache and refresh the SoftGrid application list. Like most programs the SoftGrid client stores all kind of setting in the registry. Most times you would like to change the settings they fit in to your current infrastructure. Like normal, it's a good point to distribute these settings using a central way and that settings are automatically reflected on current and newly installed machines. One of the best ways to accomplish this situation is configuring the settings via an Active Directory Group Policy Object (GPO). Especially for the SoftGrid Client settings Rodney created a template which can be imported in the Active Directory GPO. To accomplish this you open the GPO and right click the administrative templates folder. Choose the option Add/Remove Templates and browse to the location where you saved the adm template. By default the GPO editor hides unmanaged options so should change the view options of the GPO Editor (everytime you start the GPO Editor). Uncheck the option "only show policy settings that can be fully managed" within the filtering property. The settings are visible and can be configured for your needs. Remember that not fully managed settings will be retained in the registry if you place the option in unconfigured mode (earlier changed settings will not be changed to the standard value). About one month ago this new tool is released. The tool build by Dennis Damen and Rodney Medina is providing a graphical user interface (GUI) for the command line sequencer of Softgrid. Probably you did not hear before of the this command line sequencer from SoftGrid. This executable is build on request of a special customer and after that not really mentioned to the public. Till now, because Microsoft is marketing this executable as the solution for creating sequences even easier than the normal process. The executable using the capabilities of a MSI unattended possibilities to carry out the installation without manual intervention and at the same time in the background the sequence will be created. Because this executable needs a lot of parameters Dennis and Rodney create the SoftGrid Migration Tool. The tool it selves exists of an stand alone executable and a configuration file. The tool requires that the Softgrid Sequencer and DotNet version 2 are available on the machine. After starting the application the first step is to browse to the MSI file you would like to sequence. If there a MST available this one could also be connected to the MSI. In the left show advanced settings box you watch which properties are changed by the MST and/or add manual parameters to the command line to personalize the installation for your infrastructure. When the installation command line is correct you add the application to the package list. If you would like to add more application in the same sequence you can add another application following the same procedure. In the right pane you configure the SoftGrid settings. The Suite name is automatically generated out the MSI properties but can be altered if necessary. With the show advanced settings you can add additional platform on which the sequences can be used. Because the command line installer does not support Feature Block 1 you can choose for the full preload or no load. When you press the Start button the GUI generates the complete command line for the SoftGrid executable. Via this way the unattended installation will be started and automatically recorded by the sequencer. When the process is finished you have the Softgrid sequence and the MSI log of the installation in your output location. The next step is to add the application in the Softgrid database (with SFTImport) and you are ready to test the application. The command line sequencer has some limitations, so these also apply to this SoftGrid Migration Tool. They are described in the very good manual delivered by the Softgrid Migration Tool. With these three tools for Softgrid creation and testing of the sequences is becoming easier than before. With the ADM template you can configure your SoftGrid Client settings from a central point in such a way settings are automatically applied. The new Softgrid Migration Tool is an wonderful addition to the SoftGrid command line sequencer and makes sequencing MSI's muck quicker. To test the application use the Tray Utility to quick launch the application. The tools can be downloaded from LoginConsultants.com (registration required) or the website of Rodney.